As much as I like point-and-click adventures, I can be a bit particular with my tastes. Getting stuck too often for too long can turn me off from a game I’m otherwise enjoying, especially if the answers seem illogical or the puzzles require too much guesswork to solve. Layout usually plays a part in this, as well. Is the game user-friendly as far as making it easy to access available locations and items? Or is it a chore? Being able to quickly get around or at least being limited in options at any one point is a good way to keep a game from becoming tedious as the player works to solve the puzzles. This is also why I tend to gravitate towards first-person adventure games, where you can usually jump from scene to scene very quickly. Unfortunately, I’ve tried several Wadjet Eye-published games and for one reason or another, I never finished any of them. While the stories were interesting, they weren’t enough to pull me through. 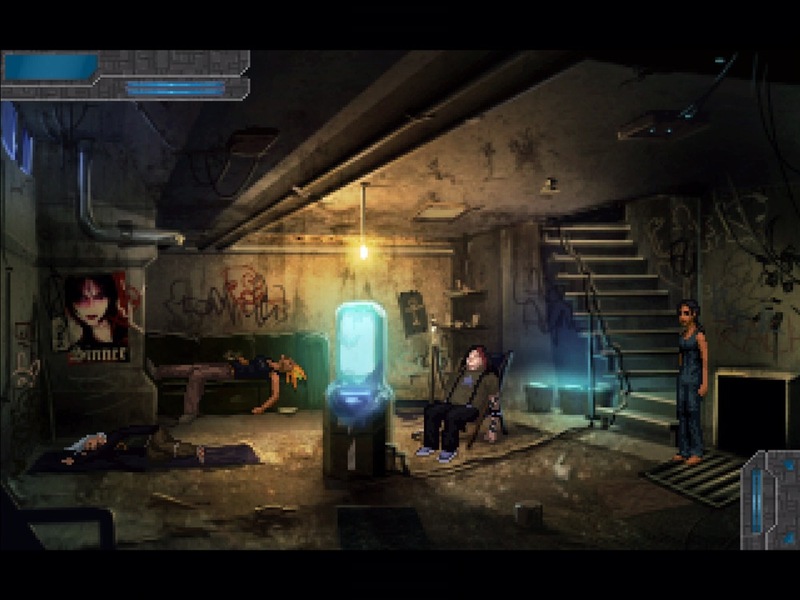 Well, that’s all changed with Technobabylon. 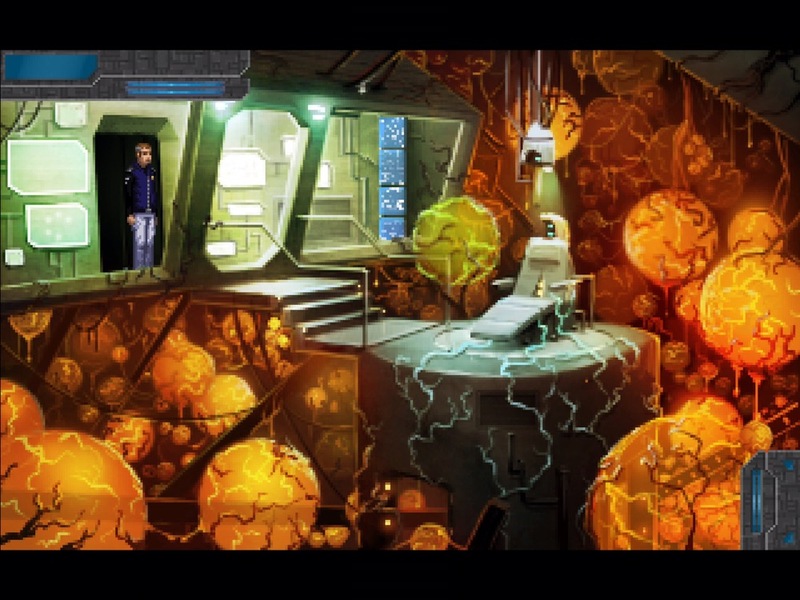 It’s the first Wadjet Eye game I completed and I rarely felt hopelessly stuck. I also thoroughly enjoyed the journey and am so glad I spent the time with these characters and this world. I immediately took a liking to Technobabylon because it starts with a room escape game. 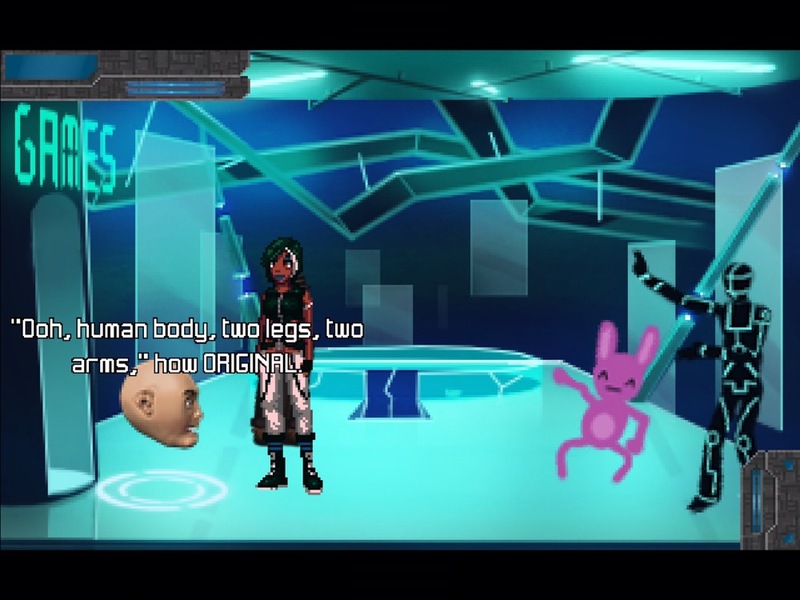 You first play as Latha Sesame, a young unemployed woman in the highly technologized cyberpunk city of Newton in the year 2087. Her apartment door got jammed and you need to find a way out with very few physical tools. While there’s no one else in the room with you, you’ll soon discover through experimentation some digital AIs you can talk to by entering the Trance, a sort of virtual reality world that Latha likes to spend a lot of time in. In fact, she rarely leaves her apartment, instead using the Trance as a way to interact with others. While the game does use this theme to reflect on our own over-dependence on technology, it never gets preachy or tiresome. Even with the story revolving around an omnipresent AI named Central that controls the city, we’re asked to ponder complex moral and philosophical questions without being told what to think. Instead, it explores these ideas through different characters’ outlooks, so we get multiple viewpoints. For instance, another character you take control of, Centralized Emergency Logistics (CEL) agent Charlie Regis, is a very old-fashioned guy. Even though he has a history in genetic engineering, or gengineering, he doesn’t trust Central and is always finding ways to turn off the cameras she uses to watch everyone, even CEL. He also refuses to get Wetware installed, the technology that enables one to hook up to the Trance and hack other systems. This means he’s limited in his interactions. But then you also get to play as his partner, Max Lao. She’s younger than Regis and doesn’t seem too bothered by Central watching her every move. She’s very comfortable plugging into her Wetware and does it almost as much as Latha does. Both agents are great at their jobs and work well together, despite their differences. I enjoyed listening to them take jabs at each other about their dependence — or lack thereof — on technology. It gave us a lighthearted look at both sides without feeling like a lecture. We first meet the agents when they’re investigating a murder that they believe is linked to the Mindjacker, a serial killer who has been downloading people’s brains and memories before killing them. As you might guess, this is only possible to do if the person uses Wetware. The investigation takes them to the home of a wealthy gay couple with a maid AI who’s very good at keeping their secrets. I don’t want to spoil it, so I’ll just say that the way you get her to spill her guts was a really top-notch puzzle, both clever and entertaining. There’s also the contrast between their lavish lifestyle and the slop that Latha has to eat because she can’t afford a better food machine. And soon after that, the Mindjacker case becomes personal for Regis. He’s faced with moral dilemmas time and time again. Usually we have no choice in the matter, but sometimes we have to make the decision for him. Either way, they’re difficult choices to make. This is a story with no black and white, right and wrong answers and that’s one of the reasons I found it so compelling. Like I said, this game explores many complex issues. This might be a bit spoilery, but one of my favorites was a later chapter in which you’re solving a murder in a restaurant that serves human flesh. It’s legal because the meat is cloned human tissue, so no living, conscious organism is harmed. There’s even the question of whether someone might want to eat their own clone. It reminded me of the TV show, Dollhouse, which was sadly short-lived but explored so many complex ideas surrounding one specific piece of technology. This chapter really got me wondering about things that hadn’t — but maybe should have — crossed my mind before. With meat currently being grown in the lab for human consumption, I’ve often wondered if pig manufactured that way would be considered Kosher. I’m also not sure how I feel about eating lab-grown meat, as the idea definitely weirds me out. But maybe it’s better than killing animals, since I do often feel bad about that, even though I don’t eat that much meat. It’s definitely something I’ve thought about, but my mind just never went this far before. And now the idea has latched onto my brain and won’t let go. I can’t stop thinking about it. It’s only a matter of time before we have to have a discussion over whether it should be legal to eat lab-grown human tissue. This is a pretty long game with lots of twists and turns and an overarching plot that unravels bit by bit. You definitely get your money’s worth here, as playing through everything without skipping dialogue should take around nine or ten hours — and that’s assuming you don’t get stuck. While some things are a bit predictable and I figured them out before the game’s big reveals, that didn’t ruin the experience for me. Part of the fun is trying to solve the mystery, after all. Another strength of the game is its superb voice acting that brings all the characters to life. There’s also a very diverse cast so they don’t all look and sound the same. It’s a great example of how to make a game that’s welcoming to all sorts of people from all walks of life. There are strong, smart and complex women who all feel like real, fleshed-out people. Some characters are more humorous with voices bordering on annoying, but it adds some welcome lightheartedness to the fairly heavy story. 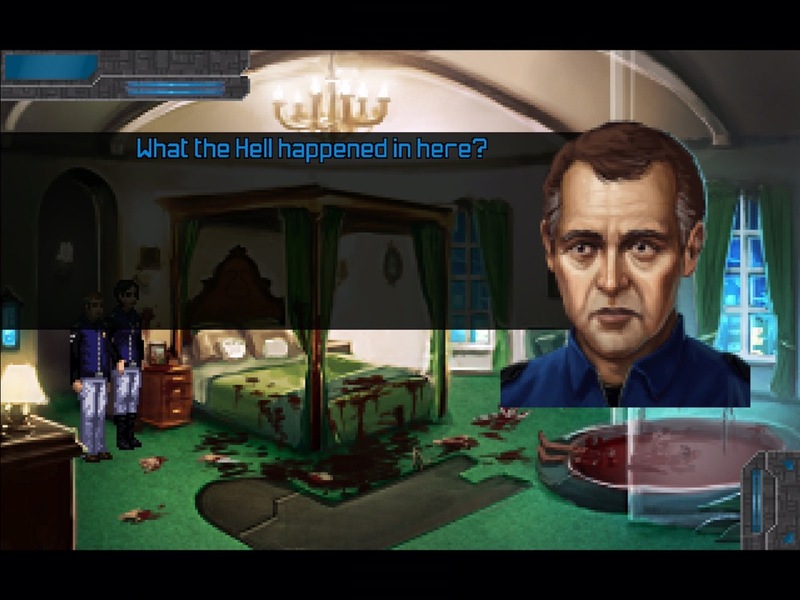 Technobabylon does suffer from a few small issues. The biggest one for me was a mini game in one of the later chapters. It’s unfair on so many levels. I realized fairly quickly that the game expected me to cheat to pass it, but on my first playthrough, the cheat didn’t seem to help. I was worried I wouldn’t get past it and would be forced to miss out on the rest of the game. And that made me incredibly sad. I persisted, though, and it turns out that after enough failures, the game makes it a bit easier to win. But it took a lot of tries before that happened. Luckily, I got past it, but that was by far the weakest point of the game for me and I could have gladly done without it. Oddly enough, on my second playthrough, the cheat worked right away and I passed in one try. I’m not sure what happened, whether it was a bug or a feature, but hopefully others won’t encounter what I did on my first time playing. 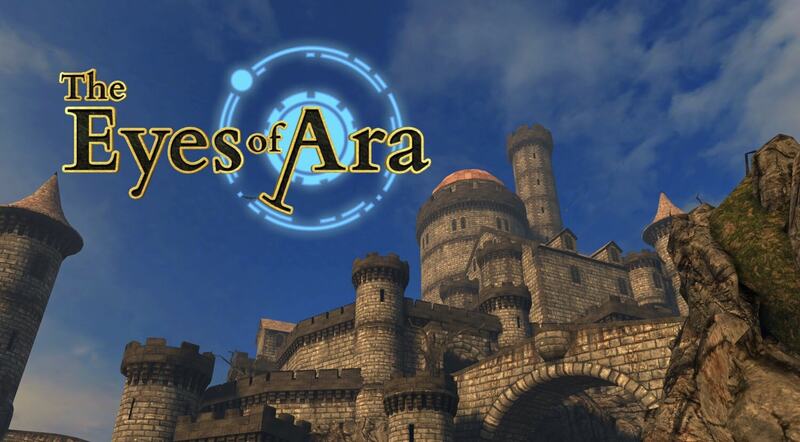 It would be a shame for adventure fans to miss the rest of the game because of a poorly designed reflex-based piece. On top of that, there were a few sections that had too much running around for my tastes. One chapter has you testing plants’ DNA. The problem is, you can only carry three samples at a time and the machine that scans them is two rooms away from a room full of samples. It gets tedious to go back and forth until you find the right ones and are sure you didn’t miss anything. Having a second scanner in the same room would have been greatly appreciated. The game also gets a little more complicated near the end, where all three characters come together. There are some time-sensitive puzzles that can be a bit annoying, but they’re still very doable. Also, at times the dialogue feels bloated and I think it could have benefitted from some cutting. There’s a lot to take in and remember. While you can skip dialogue, I wanted to read everything so I didn’t miss any details. But the long conversations got a bit tiresome after a while. I also was rushing to try and finish in time to write a review, so that might have something to do with it. I recommend taking your time with the game and slowly soaking it in. The positives far outweigh the negatives here and I’m glad I stuck with it till the end. I also always appreciated that Wadjet Eye games have unlimited save slots, allowing you to have multiple games going on at once or to save at different points in the story so you can replay a small section if you want. 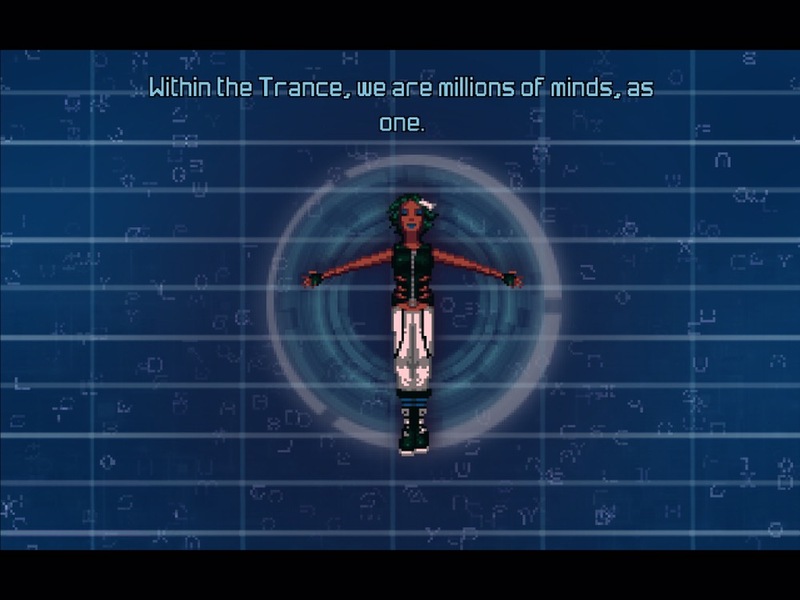 This is especially welcome in Technobabylon because there are a few points where you have to make choices, one even leading to an alternate ending. If you save frequently, it’s likely you can try both options without having to replay too much of the game. I do wish they’d utilize iCloud saves, though. I prefer to play adventure games on my iPad, but it would have been nice to take it on the go and try to make some progress. Lack of it contributed to my never finishing any of their previous games, and it did mean I was stuck playing this game only when I was home instead of making progress while I was out enjoying the spring-like weather. 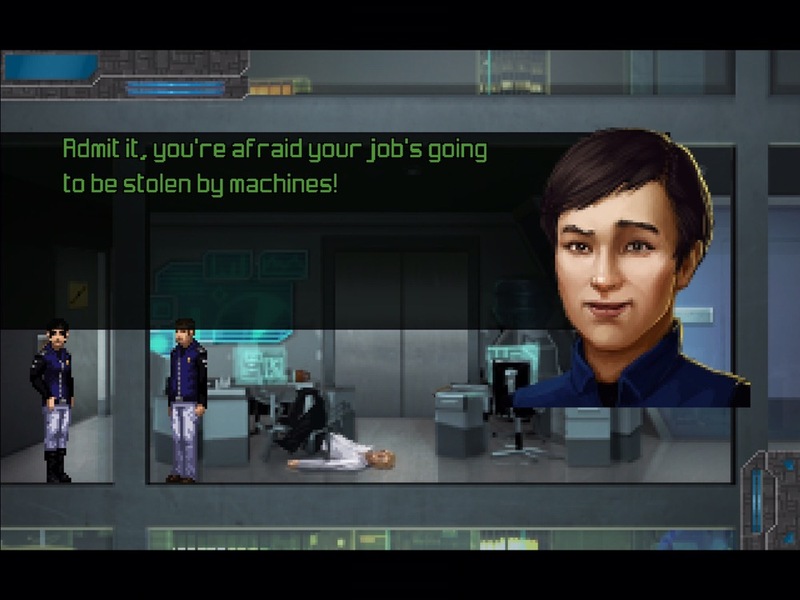 If you’re a fan of point-and-click adventures, I highly recommend playing Technobabylon, even if you’re not a big on pixel art or couldn’t get into other Wadjet Eye games. Developer Technocrat hit it out of the park with this one. Sure, there were a few bumps in the road, but as a whole, the game is great example of how to make a truly engrossing adventure game. There were so many genuine surprises, quirky characters and complex situations. I know I’ll be thinking for a long time about some of the moral questions it poses. My only suggestion is to take your time with the game, listen to all the dialogue with the voiceovers on, and try to solve all the puzzles on your own. It’s far more satisfying that way and the lengthy story should be easier to chew in smaller bites. So what are you waiting for? 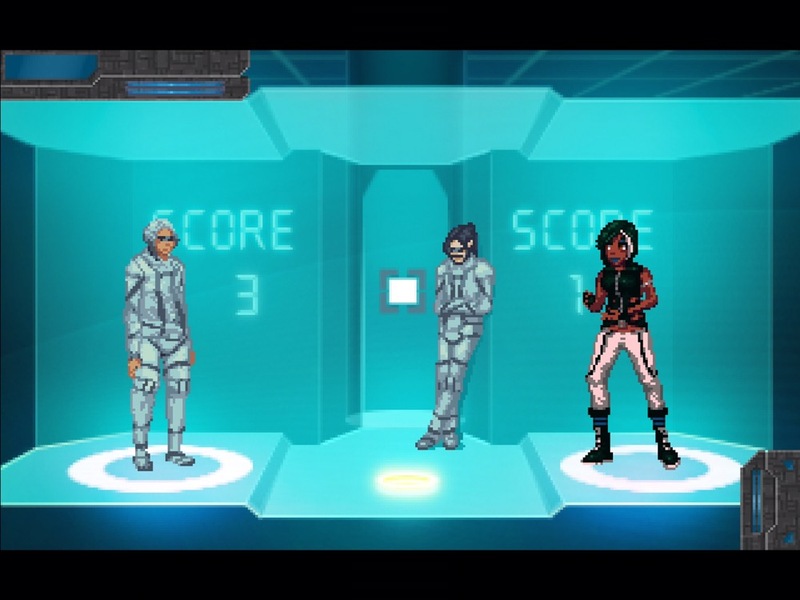 Download Technobabylon to your touchscreen Wetware and start playing! And if you get hopelessly stuck, you can try my walkthrough.